comes in a variety of sizes. The link here is the size I got which is perfect for 1-3 year old. 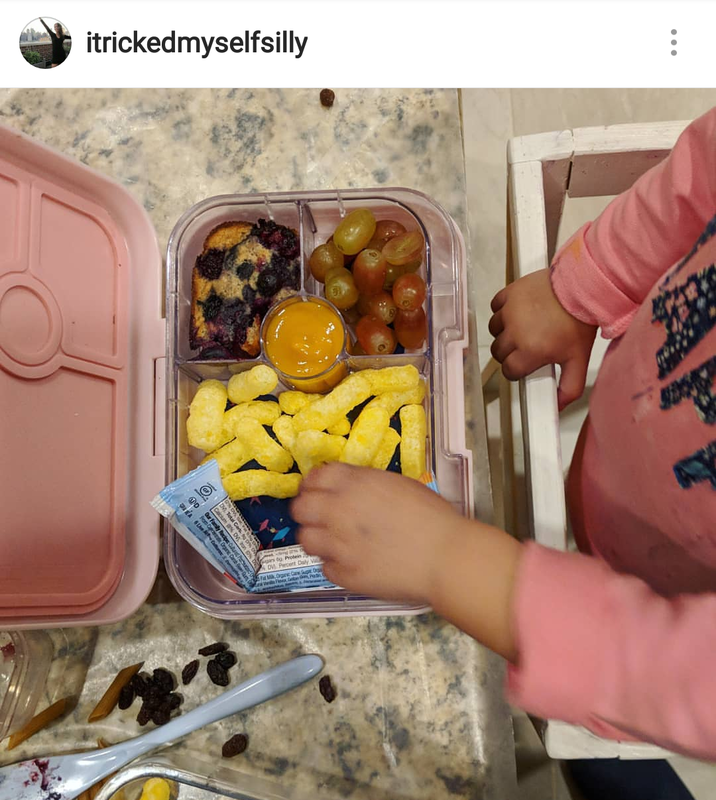 Around age 2 Maya started noticing the design pictures in her lunch box and loves them now (you can spend less to get this box without art designs). Truly doesn't leak. I've been using it multiple times a week for a year now. The only con is that you can't microwave this bento. 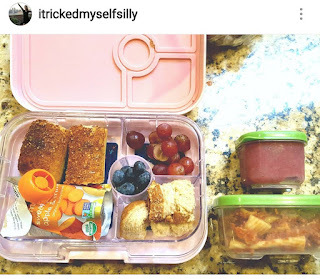 There are other bento-like boxes that will keep food hot or cold all day if that's what you're looking for. I'm also very happy with these. Don't leak, that stack nicely one on top of each other and they can be microwaved. Comes in various sizes, this is my favorite side. Only warning is not to get one that has to compartments because the good spills over from one compartment into the other. 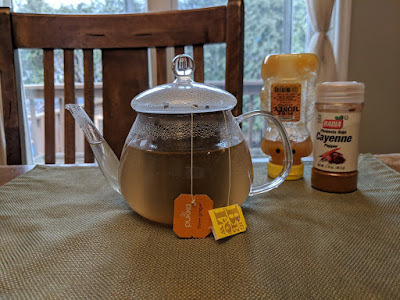 Add all ingredients and brew in a tea for two pot for 10 minutes (or longer). Recipe found through a facebook Gluten + dairy free group, originally posted on Ambitious Kitchen. All of my revisions and comments are noted in italics and purple font color. Add milk, sugar and yeast to the large bowl of an electric mixer. It's important to make sure the milk isn't too hot or it will kill the yeast. On the other hand, if the milk is too cool, the yeast will not activate. Let the yeast with the milk for 5 minutes, do not touch or stir. You will know if the yeast activated properly if by the end of 5 minutes, it has started to bubble or foam a bit. In a separate medium bowl, whisk together both flours and salt; set aside. Tip: I usually turn my oven to 200 degrees then immediately turn it off to create a little heat. After that I place my bowl of dough in the oven to help it rise. Works every single time! Grease a 9x13 inch baking pan with nonstick cooking spray or coconut oil. Once the dough is doubled in size, punch it down! Sprinkle a little gluten free flour on your rolling surface, then roll out the dough into a 15x9 inch rectangle. Spread 1/3 cup of coconut oil all over dough (you'll want it to be easily spreadable so it's okay if it's a little melted). Mix the cinnamon and brown sugar together then sprinkle all over dough. Use your hands to rub sugar/cinnamon mixture into the dough a little bit. Beginning at the larger end, tightly roll up the dough and pinch the edges together to seal. Use a serrated knife or unflavored dental floss to cut the dough into roughly 2 inch sections so that you have 12 rolls total; place rolls in pan. Once you are ready to bake the rolls, preheat the oven to 350 degrees F. Bake rolls in oven for 20-25 minutes or until a tiny bit golden brown on the edges. Mine were perfect around 23 minutes. Remember you don't want to over bake them or they'll turn rock solid. Once rolls are finished baking, set aside to cool for 5-10 minutes while you make the glaze. In a small bowl whisk together powdered sugar, almond milk, vanilla and vanilla bean. Add more almond milk if you want a thinner glaze. 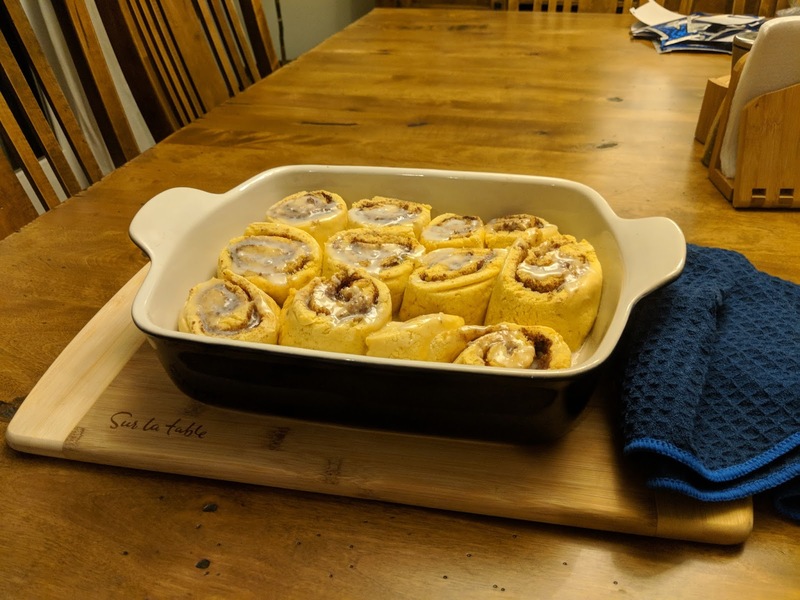 Drizzle over warm cinnamon rolls and serve immediately! If you are not dairy free, you can use regular milk and butter in this recipe, if you so choose. What can I use besides coconut oil? If you aren’t dairy free, you can use butter. If you still want to make these dairy free, you can use a vegan buttery spread. Can I sub something for the regular sugar and/or brown sugar? Yes! You can use maple sugar or coconut sugar, if you prefer a refined sugar free treat. The filling might not necessary taste the same, but I’m sure they will still be delicious! The only thing that is preventing these from being vegan is the egg. Unfortunately I had a reader report that using a flax egg didn’t turn out too well for them. Can I make these the night before and bake them in the morning? Yes! To make these into overnight cinnamon rolls, do not let dough rise the second time, instead place rolls in pan (after the first rising), cover with plastic wrap, then immediately place in the fridge. The dough will rise overnight again. The next morning take rolls out of the fridge and let them sit at room temperature or in a warm spot for 30-45 minutes, then bake as directed. Ta-da! (But note - these also taste GREAT up to 2 days after so there's no need to make it fresh the day of if that's what you're aiming for, it tastes just as good when reheating a day or two later).